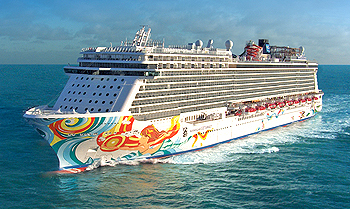 Norwegian Getaway spends her year chasing the sun. During the European summer cruise from Copenhagen to discover the beauty of the Baltics and Northern Europe or take a journey from Rome to explore the magic of the Mediterranean. As the weather starts to cool in Europe, Norwegian Getaway makes her way to America across the Atlantic, where cruises from New York could get you to Bermuda or the Bahamas, while cruises from Miami or New Orleans can have you warming your toes in the tropical waters of the Caribbean. Norwegian Free at Sea Offer! Book an oceanview cabin or higher on select Norwegian Getaway cruises and pick three Free at Sea inclusions* or book an inside cabin and pick one Free at Sea inclusion*. Plus pay just $10pp deposits on sailings departing after 15 April 2019*. View all Norwegian Getaway cruises, view a selection of Norwegian cruise deals, or view more options for Norwegian Cruise Line. Please note: All Norwegian Cruise Line departures within the next 30 days are not currently bookable online. To make a booking, view all scheduled last minute Norwegian Getaway sailings and then call us on 13 13 03 or request a callback during business hours and a member of our team will be to assist with pricing, availability and to make a booking. We apologise for any inconvenience. Dine on reinvented Irish pub classics while sipping your favorite draft beer, all in a casual atmosphere open 24 hours a day. There’s no cover charge to dig into your favorite comfort foods and savory Daily Specials, such as Prime Rib and All-You-Can-Eat Ribs, or shoot a game of pool while taking in a sports game. Available 24 hours a day, simply pick up the phone and order breakfast, lunch, dinner or late-night munchies. A convenience charge of $7.95 will apply to all orders (Continental Breakfast until 10am excluded, Haven Guests are excluded from covenience charge at all times). Seventeen decks above the sea, feel the wind in your hair, sun on your face, ocean views all around and the excitement of over-the-top water parks. With five multi-story waterslides, two swimming pools and four hot tubs — there’s more water than ever before. Take the plunge on the fastest water slide at sea – Free Fall – one of two drop-slides that drop you at 4Gs. Feel the rush of The Whip, two racing, side-by-side twister slides that are wet and wild. Or try the fun family slide, if that’s more your speed. Slide in. Get soaked. Or take a break from the action and relax in a lounger alongside the pool. Life is good at the top and overflowing with excitement. Test your luck in one of the largest Casinos At Sea or play favorites like Blackjack, Craps, Roulette, Texas Hold ‘Em and Poker. With all your favorite table games and slots, it’s easy to see why Norwegian has been rated the “Best Cruise Line Casino” of any cruise line for ten years running by the readers of Casino Player magazine and “Best Cruise Line Casino” by Porthole magazine. Splash the day away in a pirate themed environment. These life-size sculptures in the shallow pool are perfect for family fun – and family pictures. Norwegian Getaways Day Spa, Medi Spa, Salon and Fitness Center offers guests a world-class rejuvenating experience – a vacation within a vacation. Choose from more than 50 treatments, including hot-stone massages, oxygen facials, acupuncture and age-defying options. Work up a sweat in the Fitness Center, featuring free weights, TRX training, the latest cardio equipment and a schedule full of classes. Amid the hustle and bustle of the Atrium, feed your hunger for something sweet. This is a morning and late-night favorite serving pastries, cookies, teas, coffees, and espressos and cappuccinos by Lavazza. Steps away from all the exciting action at Casinos At Sea, you’ll find the bustling and intimate Bar 21. So order your favorite cocktail, while listening to the sounds of slot machines ringing and guests cheering. Sip on a Who’s to Blame Margarita or sit back and enjoy stunning ocean views at Jimmy Buffett’s Chill Bar at Margaritaville. Our buffet serves up complimentary breakfast, lunch and dinner – and the floor-to-ceiling windows provide picturesque ocean views. Action stations include meat-carving, made-to-order pastas, omelets, waffles, soft-serve ice cream and more, including specialty dishes from around the world – satisfying your every craving. A couple walks into a bar and laughs the night away. This isn’t the start of a joke, but the beginning of an amazing evening at Headliners Comedy Club. A unique arctic-like frozen chamber, guaranteed to give guests the ultimate chill. The bar, seating and glasses are made entirely from ice. The bar is kept at 17 degrees Fahrenheit and features ice sculptures inspired by the ships Magic City home. The Ice Bar also features six Florida-inspired specialty drinks made from SVEDKA vodka and Inniskillin ice wine. Salute the good life in this elegant lounge offering exclusive access to The Haven guests. Light bites are available. Guests will jump for joy upon discovering this private retreat where they can connect with the ocean – and disconnect from everything else. Exclusively for those 18 and over, Vibe Beach Club is resplendent with ocean views, an over-sized hot tub, chaise loungers and a relaxing water feature – idea for relaxation. A full-service bar, water spritzers, chilled towels and skewers of fruit ease you even more into serenity. A limited number of passes will be available for purchase onboard at the Guest Service Desk.